Tottenham Court Road is the nearest tube station. The new Albukhary Foundation Gallery of the Islamic World, opened in October 2018, displays the exquisite pieces of Islamic art that are among the eight million items collected from around the world to fill the halls of the vast Bloomsbury museum. 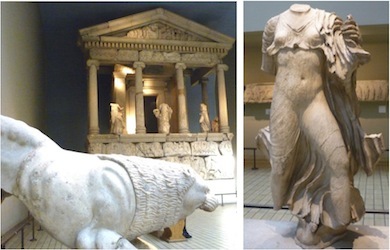 Lord Elgin’s marbles may be the star turn of the Greek and Roman collection, but the Anatolian contribution from Charles Newton’s Mausoleum of Halicarnassus from Bodrum and Charles Fellows’ Nereid Monument from Xanthos come in a close joint second. The Mausoleum was one of the Seven Wonders of the World, and its discovery by Charles Newton in what were probably the most extensive Classical excavations ever undertaken, is told by Rupert Scott in Cornucopia 41. A special room was built for the finds (Room 21) next to Elgin’s Parthenon pieces, and this is now ruled over by colossal figures originally thought to be the Carian king Mausolos and his sister-wife Artemesia (above) who stand before a handsome horse’s head with bronze bridle and bit from a quadriga and fragments of a chariot. Newton’s earlier discoveries had been in Rhodes and in Didyma, where he acquired statues of seated figures and a lion from around 600BC that had lined the Sacred Way (Room 13). What alerted Newton to the site of the Mausoleum in Bodrum were blocks from a frieze re-used by crusaders in their castle. These lively sculptures from the top of the podium are the best preserved of three rows of friezes, telling tales of Herakles’ and Theseus’ venture into Themiskyra, home of the Amazons, and their subsequent battle. The Amazons are on horseback, a trick the Hellenes had yet to master, and they are shown riding facing backwards, or shooting over their shoulders (see above left). Other finds from the Mausoleum include a powerful Persian rider and a stone lion, which is not quite as dramatic as the six-ton beauty that Newton brought from Knidos, the headland opposite Bodrum, that has pride of place in the museum’s Great Court. From Knidos, too, come other finds, such as the 4th-century BC statue of a priestess from the tenemos of Demeter, which yielded a number of votive offerings, figurines and lamps. Newton also started to excavate what has become known as the House of Charidemos, a 4th-century AD villa in Bodrum. A dozen of its fine mozaics line the West Stairs at the museum. The Temple of Artemis at Ephesus, another Wonder of the Ancient World, was unearthed by John Turtle Wood, sent to Turkey to construct railway stations for the Smyrna to Aydın railway. Becoming enthused with the past, he returned to seek a commission from the British Museum. On December 31, 1869, while excavating the theatre at Ephesus, he unearthed the temple. The largest of the items sent back to the museum were the best preserved marble column drum and two enormous ionic capitals 3 metres long, displayed in the Greek and Roman Archiitecture room, Room 77, on the lower ground floor. But perhaps the most appealing sculptures from Anatolia come from Xanthos, which the artist Charles Fellows stumbled on in 1838. Based in Smyrna, Fellows wrote such an engaging account of his travels through Lycia, where he identified more than a dozen significant ancient cities, that Prime Minister Palmerston sought a ferman from the sultan for permission to excavate. The main focus of Room 17 where Fellows’ Xanthos treasures have been reconstructed, is the Nereid Monument, built for Erbinna (Arbinas is Greek) who died in 380BC. Its name comes from the statues of sea nymphs that decorated this tomb built in the Ionic Greek style. Three of these, displayed free standing, are held up as examples of Classical sculpture at its height. On the morning of November 15, 1856, there was excitement in the normally sleepy town of Bodrum. HMS Gorgon, a steam-driven corvette of the Royal Navy, lay at anchor in the bay, almost in the shadow of the Castle of St Peter. It began to disembark great quantities of equipment. Carts laden with pickaxes, iron bars, huge coils of rope and chain, pulleys, hoists and blocks were being pulled up the beach. 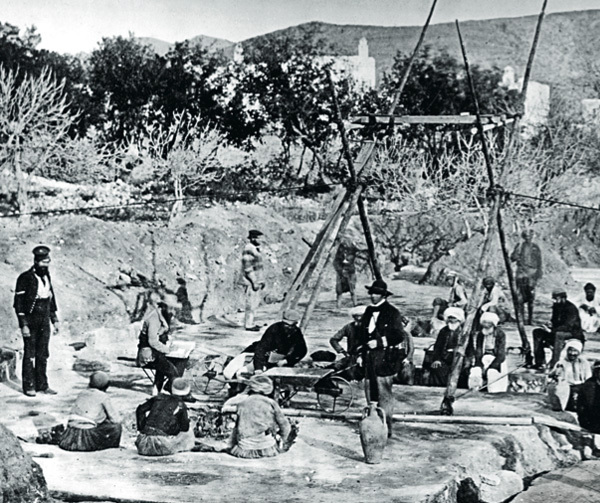 This was the beginning of the archaeological expedition to Bodrum and Knidos (Cnidus), the most ambitious of the official British excavations in Asia Minor during the nineteenth century, and the longest – lasting two-and-a-half years. 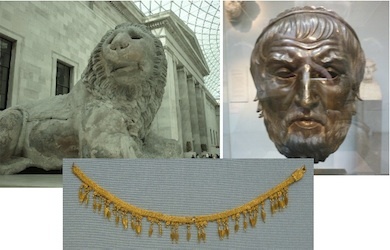 From the British Museum’s point of view, it was also the most successful, producing three shiploads of excavated material, among which are some of the museum’s greatest exhibits – the Knidos Lion, the colossal seated statues from Branchidae, and of course the sculpture from the Mausoleum of Halicarnassus itself. This was possibly the first archaeological expedition to be recorded photographically from start to finish. Upwards of 200 photographs were taken by Corporals Spackman and McCartney of the Royal Engineers, using the collodion process, which required a portable dark chamber. This was more difficult to manage than the more common waxed-paper method, but produced sharper, more brilliant images. The expedition was led by Charles Newton, then forty years old, who would later become Sir Charles Newton, keeper of Greek and Roman antiquities at the British Museum. In photographs he appears a short, slight, retiring and effete figure, rather incongruous among the tough sailors and the semi-military equipment of the expedition. In reality he was anything but retiring and effete. He was ruthless in the pursuit of his goal and as adept at dealing with the Foreign Secretary in London as with the proprietors of the houses in Bodrum inconveniently placed in the way of his intended excavations. Newton had entered the British Museum in 1840 as an assistant in the Antiquities Department (antiquities, classical, oriental and medieval, as well as ethnographical objects, were at the time in one department). In 1852 he left the museum to become vice-consul at Mytilene, with the object of exploring the coasts and islands of Asia Minor. Unofficially he was the British Museum’s scout in the east Aegean, actively pursuing antiquities to send back to London. With funds supplied by Lord Stratford de Redcliffe, then British ambassador at Constantinople, in 1852 and 1855 he made important discoveries on the island of Kalymnos. However, excavations on a more ambitious scale in Bodrum and Knidos had been in his mind for some time. Well-connected and persuasive, on a visit to London in the summer of 1856 he had convinced Lord Clarendon, the British Foreign Secretary of the time and an enthusiastic antiquarian, of the potential benefits of an official expedition to these sites. In August Newton submitted a detailed paper to Clarendon identifying three principal benefits from the proposed expedition: “firstly to secure further sculpture from Bodrum Castle [thereby adding to the so-called ‘Canning Marbles’ at the British Museum, removed from the castle in 1848 at the instigation of Lord Stratford de Redcliffe, then Stratford Canning], secondly to identify and excavate the site of the Mausoleum of Bodrum, and thirdly to carry out excavations in Knidos”. For excavations there, “a ship of war would be absolutely necessary, for there is no village on the spot. Both food and water must therefore be imported…The masses of marbles that encumber the ground could only be cleared away by the application of strong tackle…which are only to be found on board a man of war”. Newton originally envisaged a six-month expedition, from mid-October to mid-April, at a total cost of £2,000. He believed it would be possible to spend less, but his experiences at Kalymnos had shown him that “the chances of success are diminished by conducting researches on too minute and economical a scale”. In reality, Knidos was to prove a more difficult site for excavations than Newton had anticipated. Clarendon approved the project and its budget of £2,000 in the first week of September, and from then things proceeded with astonishing speed. By October the expedition had been assigned an engineer, sappers and miners – and, at the suggestion of Newton, a photographer. Three artists, including the twenty-one-year-old GF Watts, were to accompany the expedition. “I am particularly anxious that Watts should join the expedition,” Newton wrote. “I know of no modern artist who draws sculpture so well.” Sadly, no drawing by Watts from the expedition appears to have survived. The admiralty, meanwhile, assigned HMS Gorgon to the expedition, and filled her hold with impressive quantities of rope, purchase blocks, spars for scaffolding, planking, tramways, tents, barrows and tools. Explosives were sent from Woolwich Arsenal. The stores list reads like that of a small military expedition. And so, in mid-November, the expedition had arrived in Bodrum. Newton found accommodation at the konak of Salik Bey, the local agha, and, with a mixed party of sailors from Gorgon and hired Turkish day labourers, he began to dig. As he had predicted, locating the site of the Mausoleum proved difficult. Although in the early fifteenth century its site had been discovered by the Knights of St John, and plundered for building materials for Bodrum Castle, by 1856 there was no visible trace of the monument, despite its size (Pliny describes the structure as about 45 metres in height). He started to dig, first near the castle, then near the theatre. There was no sign of the Mausoleum at either site. However, in late December his luck changed. Perhaps on the advice of Lt Murdoch Smith of the Royal Engineers (which is not acknowledged in Newton’s shamelessly immodest account), he directed his workforce to dig a site almost in the garden of the konak where he was living. Here, in mid-January, the Mausoleum was located. 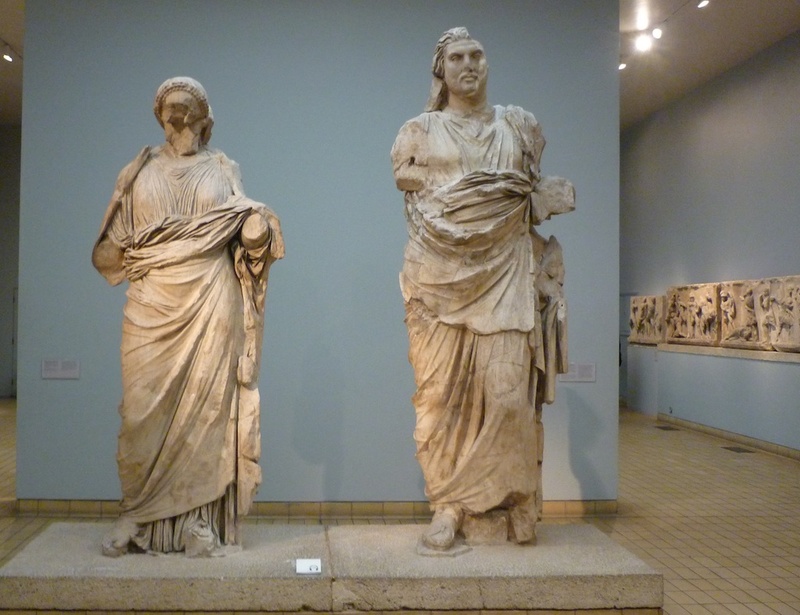 Between then and June he discovered most of the sculpture now on display in the Bodrum room of the British Museum. Next he found two large fragments of high relief of the battle between the Greeks and the Amazons, which ran in continuous relief round the whole building, “a slab of extraordinary beauty”. There were Amazons on horseback and another Amazon on foot “in extraordinary preservation” and “finished with the delicacy of a coin or cameo”. These pieces he considered to be “far superior in execution and condition to any part of the frieze now in the British Museum”. A ten-foot female statue swathed in heavy drapery, possibly a portrait statue of Artemesia, builder of the Mausoleum, he describes as “the most valuable discovery which has been made on the site of the Mausoleum”. In late April he reported the discovery of a “female head of colossal size”, adding that it was “the most beautiful I have ever seen except that of the Venus at Arles”. There was, however, a problem. The site was occupied by several houses and their gardens, whose owners held out for a high price. Some of these houses Newton purchased and demolished. Others he dug around and actively undermined. But some owners either refused to sell or asked sums he was not empowered to pay. Lord Clarendon’s letters from the Foreign Office show his keen interest and support: “Neglect nothing that will make your labours complete,” he writes in a letter of May 20, 1857. “You are authorised to purchase whatever houses you think might be desirable to remove in carrying out your operations.” Newton then raised his offer, but several owners simply refused to sell. An incident in March 1857 revealed Newton at his most ruthless. The firman authorising the removal of the lions from Bodrum Castle was finally issued in Constantinople. The commandant of the castle was aware that the firman had been granted and was en route, but was unwilling to surrender the lions. He had them removed and put on a caique for transport to Cos. When the firman arrived, the caique was still in Bodrum harbour and, with breathtaking arrogance, Newton had the lions removed and transferred to HMS Gorgon. In his published diary, Travels and Discoveries in the Levant (1861), he describes the incident with a great air of triumph. By the standards of modern archaeology Newton’s technique was shockingly unscientific, but it was certainly fast and effective. A team of up to 100 pickmen cut trenches in the ground, supervised by sapppers. The spoil was sifted for marble fragments, which were collected. In fact the sculptures now in the British Museum were reassembled from dozens of fragments (the colossal male statue, possibly of Mausolus, was reconstructed from “upwards of fifty fragments”). At the end of June Gorgon left with 218 cases on board. The magnificent horse, too large to fit in the hold, was strapped down to the deck. HMS Supply took her place in Bodrum, and Clarendon agreed to increase the expedition’s budget by a further £1,500. Excavations continued in Bodrum through the autumn, but the pace of discoveries slowed. In December Newton moved to a camp at Knidos, about twenty miles away, with a party of about ten people, including a photographer and six marine guards, since an attack by pirates was not impossible. Initially he was enchanted: “There is something very attractive in this place – the delicious freshness of the air, the beauty of the scenery, the stir and activity of our little colony in the midst of such loneliness and ruin, are a pleasant change after the monotony of our life for the last twelve months”. However, life proved to be unexpectedly harsh. His excavations, too, were more difficult and less productive than he had hoped. Newton’s plan was to employ men from the nearby village to cut away the brushwood encumbering the ruins, after which he would be able to decide on the best ground for excavation. “I think the principal object of the expedition should be determining the site of the Temple of Venus [Aphrodite] in which the celebrated statue by Praxitiles stood,” Newton wrote. But the Turkish workmen were initially hard to find, and he was unable to locate the temple. Diggings near the lower theatre produced no very spectacular finds. “The Hellenic remains are so overlaid by subsequent Roman structures that it is most difficult to select a promising site for excavation,” he wrote in February. It was not until March that he made his first discoveries at Knidos – a tomb on the Tekir promontory so well hidden by brushwood that it still contained three sarcophagi and the statue of a seated Aphrodite now on display at the British Museum. In May the great Knidos Lion, now in the British Museum’s main hall, was discovered. It stood at the top of a cliff, on a high promontory about four kilometres east of Knidos. Originally it had surmounted a tomb, but it had been toppled by an earthquake. The magnificent lion, weighing some nine tons, had to be brought down a very steep incline and loaded onto a boat, using only wooden blocks and ropes – a difficult task for the twenty-one-year-old engineer in charge (the same Lt Murdoch Smith who had helped locate the Mausoleum). This operation took a month, and involved building a road, still visible today, which zigzags from the clifftop down to a rocky inlet below. The lion was mounted on an improvised wooden sledge and very slowly lowered down the road. Several sailors were injured in the process. By July 1858 it seems from Newton’s letters that he had lost hope of making any more spectacular finds at Knidos. “I am not prepared to recommend any further expenditure on the site of the ancient city itself,” he wrote to the new Foreign Secretary, Lord Malmesbury. Instead he preferred to concentrate on the removal of statues from the Sacred Way at Branchidae. He had seen “an avenue of seated colossal figures” (leading from the sea to the famous Temple of Apollo at Didyma) in October of the previous year, and had immediately asked the ambassador in Constantinople (now Sir Henry Bulwer) to apply for a firman to remove them. His justification was that otherwise they would be damaged. “I would venture to submit to your Lordship,” he wrote to Clarendon, “that such interesting monuments of early Greek art as these should on no account be left in their present situation exposed to mutilation and ultimate destruction at the hand of the barbarous inhabitants of Geronta [a Greek village nearby]. A lion recently unearthed by the Caimakam of Samos has been injured since it was uncovered.” The inhabitants of Geronta had “scored the surface with knives”. On August 18 the firman to remove the statues arrived. Newton writes: “I at once embarked a party of sixty Turks on board the Supply with all the machinery and stores necessary for the removal of statues in the Sacred Way.” The operation to remove ten sculptures, a lion and a sphinx took less than a month. By September 25 Newton was back in Knidos. In the remaining six months at Knidos Newton made a final attempt to find the famous Temple of Aphrodite, but without success. By March 1859 it was clear that Knidos was producing little and that Newton was exhausted and anxious to return home. He had been working for two and a half years without leave. The Foreign Secretary, Lord Malmesbury, and the Treasury were equally keen to end an expedition that had now cost over £5,000. On March 22 Newton received a telegraph from Malmesbury requesting that he bring the expedition to a close. In June 1859 HMS Supply finally left Bodrum, leaving behind a mausoleum excavation site that Newton describes as “a desolate looking spot, of which the idea is finer than the reality”. In London the expedition was viewed as a resounding success. At the instigation of Lord John Russell, Newton was paid a £500 bonus, as a token of appreciation, from the total parliamentary grant of £7,000, to cover the expenses of an expedition that had lasted in all thirty-two months.